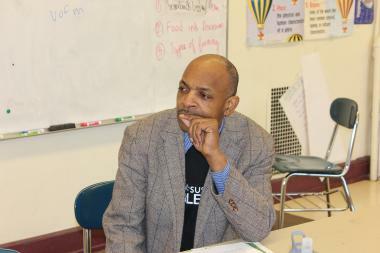 John Paul Jones, president of the nonprofit Sustainable Englewood Initiatives, spoke to Lindblom high school students Wednesday, Feb. 19, 2014, about life as a community activist. WEST ENGLEWOOD —The Social Activism Club at Lindblom Math & Science Academy High School discovered some things Wednesday about Englewood not in their textbooks. A group of six students and two teachers at the South Side school, 6130 S. Wolcott Ave., learned about the Englewood "flyover" bridge under construction; a rail yard expansion by Norfolk Southern Corp. and how to get City Hall to listen to residents' neighborhood concerns. 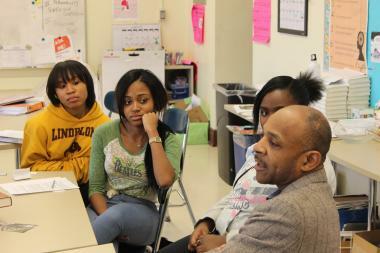 John Paul Jones, president of the nonprofit Sustainable Englewood Initiatives, led a discussion about the community. "There is a lot going on in Englewood besides high crime and unemployment that you might not know about," Jones told the students. "I know some if not all of you may not live in Englewood, but because you go to school here, you are a part of this community." John Paul Jones is president of the nonprofit Sustainable Englewood Initiatives. He described step-by-step how his organization stopped Norfolk Southern from what he said was a land grab, and how it negotiated with the railroad company and City Hall to ensure Englewood residents did not get the "shaft." "I initially found out that Norfolk Southern was seeking to buy 105 vacant lots owned by the city by reading the legal notices in the paper. I was shocked that I had not heard anything before then," recalled Jones. "From there [Sustainable Englewood Initiatives] was formed to fight for residents and prevent any further health hazards to the community." He contends that Englewood has the highest asthma rate in the country largely due to exhaust fumes from hundreds of trains that pass through the neighborhood daily. "That's why it is so important to get the Englewood 'flyover' Bridge built as soon as possible," said Jones. According to the Merck Childhood Asthma Network, a non-profit health organization in Washington, D.C., asthma-related hospitalizations in Englewood and West Englewood are among the highest in Chicago at 60 percent and 71 percent, more than double the city’s average of 31.6 percent. Kasandra Negret, 17, asked Jones if he thought other organizations would have stepped up to address health concerns about the expansion if he did not. "I would have hoped so, but I didn't see anyone else stepping up to the plate when this all went down," Jones said. "But that's part of being a community activist. Sometimes you have to be the one to speak up for people who do not speak up for themselves even when they should." Joining Jones was John Ellis, a longtime Englewood resident and community activist. "Fighting City Hall is no joke. At first they did not take us serious, but in the end they changed their minds," Ellis said, referring to earlier negations Sustainable Englewood Initiatives had with the railroad and City Hall. "There is so much available land in Englewood, it is easy for a company to do a land grab if no one challenges them." The club meets every Wednesday. Its advisor, Nora Berdeloe, who also teaches sociology and Advanced Placement psychology, invited Jones to speak to her students "because I thought it was important that they learn more about Englewood and its leaders. "My goal is to get students more involved in the Englewood community," she said. Kira Murphy, a 15-year-old Lindblom sophomore, lives in Englewood and said she knows about the challenges it faces. "There are good and bad things about every neighborhood, but if you don't live in Englewood all you ever hear is the bad stuff," she said. "What about the good stuff? Lindblom is a very good high school and it's located in Englewood. That's something good people need to know." Lindblom senior Kayla Clancy, 17, lives in nearby Auburn Gresham, a community faced with some of the same challenges as Englewood, like high crime and unemployment. Clancy said it's good to know there are people like Jones working to improve the quality of life for Englewood residents. "It never hurts to have someone advocating for you," Clancy said. "I guess that is what being a community activist is all about."